Now, 5 months on from the EU referendum, I am growing rather tired of people over-interpreting what the referendum meant, and trying to use something that happened before 23rd June to justify what should happen now. 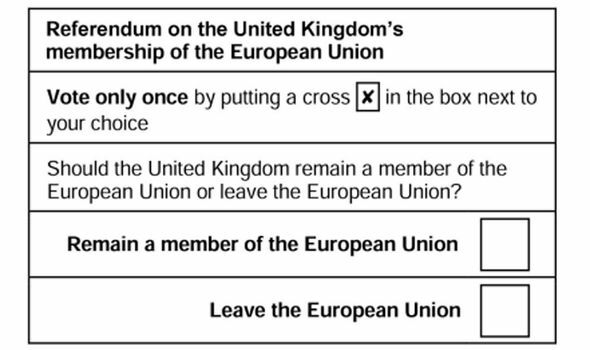 First of all, the referendum question – it was: Should the UK remain a member of the European Union or leave the European Union? (ballot paper shown here). That’s it. Nothing more. Secondly, what that means – legally – is clear. There are 28 countries in the EU, and being in the EU means being a signatory of the EU Treaties. Any country not among that 28 is out, and that hence includes countries like Norway and Iceland and Canada and North Korea. Being like any of those means to have left the EU. Thirdly, what additional promises and comments were made during the referendum campaign are all not worth the paper they were written on. From both sides. No-one can pick and choose those now. The same goes for whatever the politicians campaigning on either side said then. £350 million for the NHS if Britain leaves? Sorry, UK does not pay that much in, net, and there is no way it can all go to the NHS even if the UK leaves. Cameron saying he would trigger Article 50 the day after the referendum? Well he did not, and resigned instead, and there is no way now to hold him to account on that. There was no consensus on what Leave meant before the referendum, so we cannot conclude there is a consensus afterwards. There was also – unlike the Scottish independence referendum with their Scotland’s Future White paper – no agreed plan for Brexit. So every conclusion about what Brexit actually means is hence nothing more than the individual person’s own interpretation of what sort of Brexit is best. You may argue Britain ought to leave the Single Market, or not, but you cannot conclude the answer to that from the referendum vote itself. You cannot say that the referendum meant ending freedom of movement, or that it meant to opposite. And that is all even before you begin to work out whether any of these things are mutually exclusive, or what the variety of different organisations on each side said. So by all means make your case for what sort of Brexit you want. But for goodness sake do not demean us by trying to conclude something from the debate before 23rd June – you cannot draw any solid conclusions from that debate as it is impossible to draw solid conclusions from what was said then. We can conclude nothing from the vote itself other than the UK will leave the EU. The rest is just interpretation. A much more detailed piece about this issue can be found on the UK Positive blog here. Do read it – plenty of info from on the campaign trail too. Whatever Brexit you want, make the case for it. Don’t dream up justifications from prior to 23rd June that don’t stand up to scrutiny.